The civil parish of Finchampstead offers a lot to visitors, and even more to those of us who live here day to day. With beautiful scenic attractions like Warren Wood, there’s been a long line of people who’ve visited the area. Most notably, as history has it, many of Royalty would come to the sparsely wooded area to hunt, and there’s even stories of King Henry VII bringing Prince Arthur, his son, onto the Ridges to meet for the very first time Catherin of Aragon. A tale from the same period is that Henry VIII was at the manor-house of East Court where he wooed two sisters, with one taking her life in a jealous rage! Taste the Cracklin can’t do anything quite as dramatic as that, but we don’t half come close with mountains of mouth watering roasted pig for you and all of your guests. We set out to be the best, generally speaking and for all individual events, you’ll never see a second-class service by us, the hog roasts are never anything short of profoundly tasty. The name Finchampstead is supposedly derived from the fact that the area has a remarkable variety of finches which populate it. Where as we get our name from the fact that our spit roasted pigs have the best crackling that Gods green earth has ever known. The crackling is so crunchy and rich that people can never stop talking about, always wanting extra to go with their hog roast Finchampstead meal. 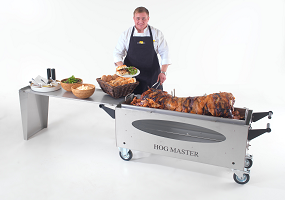 Our hog roast Finchampstead catering is a triumph of tradition, made better ironically by ever improving technologies. The method is still the same as it’s always been, nothing has changed as far as skewering the pig and cooking it, but what has changed is the detail. Wooden skewers have been replaced by cleaner, more sterdy steel skewers; Wood fires to heat the pig have given way to gas powered flames, although we do still have some old fashioned machines at our disposal; the manual turning of the pig is now done automatically by our machines; and perhaps most importantly of all is the size and quality of pigs we’re using. As farming and farming methods have improved so has hog roasting, spit roasted pig has never tasted better than ours does. Despite the area not having an enormous amount of residents, we manage to get through that amount of food as we’re on jobs each week, our weekends are often action packed, taking us from place to place, making roasts from pig to chicken kebab. We’re particularly proud of our menus, they’re a source of constant catering events because we’ve managed to find something for everyone. If a guest isn’t the biggest fan of pig, not a problem, they simply look to our various other spit roast choices – and there’s a lot of those. There’s even the modern British favourite of grilled 100% beef burgers – British beef, of course – and gourmet sausages made from the same local produce. Throw in several starter choices, about 10 dessert menus, the same number of salad and potato dishes, and untold canape choices, and you’re surely on to a winner! But you can just as easily be on to a winner without our help… Well, with limited help… A big help actually, but the point is there are no chefs required, only you. I’m talking of course about our now well known hog roast caterer in Finchampstead, Taste the Cracklin. It’s hog roasting like you’ve never known before. No caterers required, no waiters, not even a chef, just you to watch over the hog roast every once in a while to make sure it’s cooking okay. It sounds easy, right? Well it’s even easier than it sounds! The great thing about our machines is they’re not the regular cheap ones that others offer, they’re not made in some foreign country by slave labourers, they’re made here and they’re produced by us for the maximum experience. We’ve created several different machine models up to now, they’re different sized and so have different capacities, each has adjustable attachments for a wide range of spit roasting. From whole lamb and pig to cuts of beef and many poultry options can be cooked with it. Because the village isn’t the biggest there’s also the fact that we will deliver it ourselves, meaning that you don’t have to lose any sleep worrying about it being delivered on time, as we always strive to deliver on the dot.